Zulu Love is a group of musicians based in Soweto, Johannesburg. 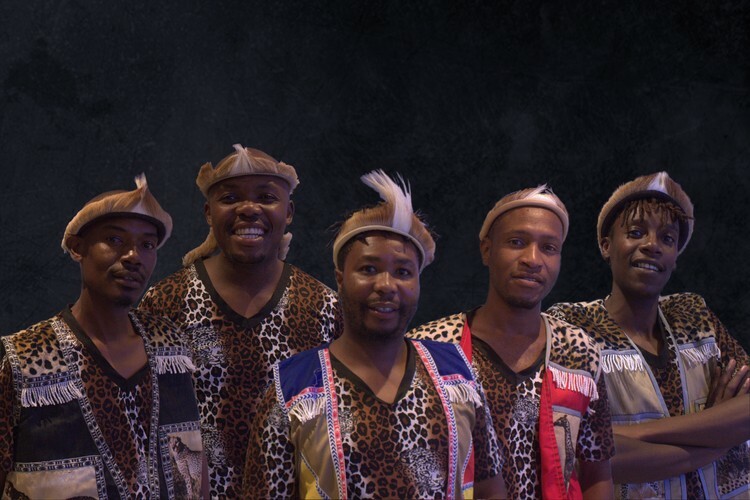 Their deep rich African harmonies blend traditional styles such as isicathamiya with upbeat African soul music. The singers are truly world class and have sung at the opening ceremony of the London Olympics and the FIFA World Cup in South Africa. They have also starred in global touring productions of major South African musicals such as Stimela the Musical and Spirit and Bones. The band members come from different musical backgrounds, from gospel to R&B and traditional music styles such as Iscathamiya. Their music is a fusion of these different styles never losing the flavour of Africa. In Zulu Love’s 2018 show –South African Harmonies- the songs and dance tell of everyday life, love and worship. “In South Africa music and dance go together, it is in our blood. No matter what we are doing we will sing and dance. We dance when we are busy at home, when we work and even at funerals. Music heals our souls, when we are sad music revives our spirits. All in all music is food for life”. “We hope to take the audience to South Africa with our show and put a smile on their faces. If you feel sad, you’ll be happy; if you are happy, you’ll be happier. Zulu Love is there to heal your wounded soul”.